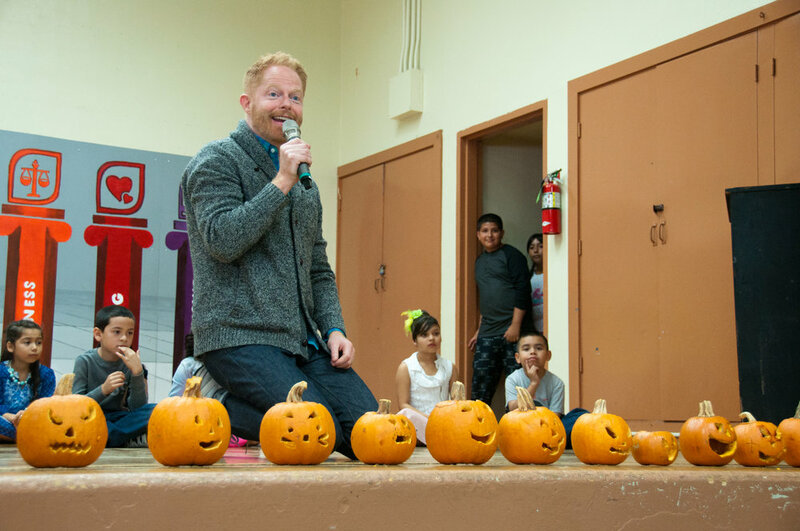 On Thursday, October 27, Jesse Tyler Ferguson visited Avenal Elementary School in Avenal, California, to enjoy and participate in a day full of dancing, arts & crafts, and poetry. Avenal Elementary School, located 200 miles north of Los Angeles in the state's Central Valley, is one of 68 schools part of the Turnaround Arts Initiative, a public-private partnership led by the President's Committee on the Arts and the Humanities to help turn around America's struggling schools. Jesse Tyler Ferguson is one of dozens of Turnaround Artists who adopt Turnaround Arts schools, working directly with students and teachers, engaging parents and the school community, and highlighting the positive impact of the arts on their school’s transformation. At his latest visit to Avenal Elementary School, Jesse was treated to special dance and poetry performances by two 2nd grade classes, after which he spoke to the students about the importance of arts education in his life. Jesse added his hand print to the school's Red Ribbon Week mural with the help of kindergartners dressed for pajama day and also had time to speak with cast members from last year's production of Alice in Wonderland. Jesse is proud to be working with Avenal Elementary School for a third year as part of the transformational Turnaround Arts Initiative. The Turnaround Arts Initiative is making significant impact across the country by improving math and reading scores by double-digit percentage points and decreasing in-school and out-of-school suspensions, some by as much as 89%.